As the only civilised settlement in the realm, the Glyphstone village is the place where all adventures begin. The practice grounds, prison and the dojo offer an opportunity to practice combat skills, the store has a wide selection of basic weapons and the stables can outfit you with a mount. There is also an arena and several duelling grounds where you can match your skill against that of both friends and foes, a gym where you can change your character's setup, and a temple. Living for years in the seclusion of his castle, the Black knight does not entertain visitors. He is a skilled warrior, and his armour is rumoured to be unnaturally light and strong. Many a freshly born avatar, seduced by the proximity of the castle and the easy journey, has fallen victim to his blade - or has defeated him only to find themselves face to face with a bloodthirsty suprenaturalis. Unlike most of the realm, the tower is a playerkilling area. Located a short ride to the northwest from the village is an abandoned temple, with its crypt lying in ruins. Various undead beings and cadaver eaters have infested its dark corridors, but an avatar with some training should be able to handle these primitive beasts rather easily - and, who knows, maybe leave with magical treasure. If you are looking for your first dungeon adventure, enter the temple from the north and try your luck in the crypt. Deep within Greenleaf Forest, near the source of the Crimson River, a smelly hole leads into a goblin lair. The goblins will protect their lair and their king with crude weapons and primitive magic, and gnaw on the bones of any intruder they manage to corner and defeat. While even a single fanatic can catch an unprepared adventurer by surprise, the goblins' main strength lies in numbers. 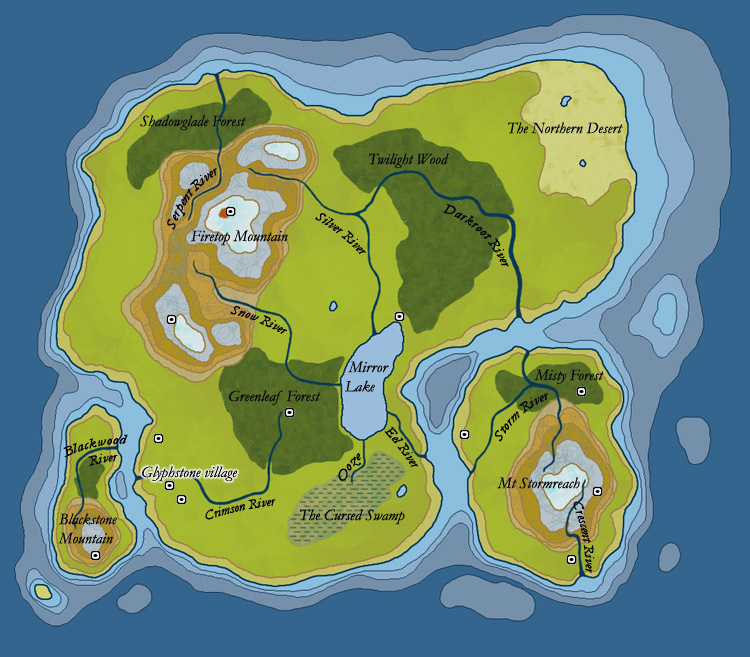 A half-submerged cavern complex on the northern shore of Mirror Lake is home to a tribe of nagas, lead by their queen. The naga males are mostly warriors, skilled with kris and trident, as are the females of the lower castes. The higher caste females, easily recognised by the blue colour of their skin, are talented magic users. The queen herself is a powerful psionic, and is known wide and far for her skill with two whips. Nobody knows who built the labyrinth on the southern slopes of Blackstone Mountain, but scholars agree it was not the minotaurs. More likely, the minotaurs have been once guardians of whatever purpose the structure served, and formed their own society after the labyrinth had been deserted. Having been bred for fighting, they know little else and will attack intruders on sight. The labyrinth is a dangerous place to explore, best left to those with a lot of combat expertise - or those bored with life. Gnomes operate a mine at the soutwestern side of Firetop Mountain. The work is hard, and the threat of being attacked by a basilisk, a promethean, or even a treasure hunter is omnipresent. Gnome soldiers try their best to protect the miners as they go about their work, but the monsters inhabiting the dark tunnels are fierce and fatalities an everyday reality. Somehow, however, the gnomes manage to carry on, to the satisfaction of their chieftain. Legends say that an ancient firebreathing dragon lives deep within the crater of the Firetop Mountain, and even attribute the occassional eruption to this beast. Whether the latter is true, opinions differ, but scorched adventurers, some of them missing limbs, make it back to Glyphstone village from time to time, telling tales of strange beings formed of plasma and of a she-dragon that can bite off a man's head as if it were candy. Only one way to find out if these tales are true - but what fool would venture into a lava-filled crater? Far to the east, on an island, the wolfkin have built a den in a misty forest. Should you want to become one of the pack, a werewolf, you will need to prove yourself by defeating their champion and earning magical tokens as a prize for your victory. The Blood Warrens lie just north of Storm River, on the eastern island. Wolves that may not be wolves at all and rats that may not be rats have been spotted here, and some of those that have visited the place have returned as vampires. If you believe that should be your fate, seek the bloodguard champions and obtain your tokens from them. But be warned that they will not give them up without a fight. Near the mouth of Crescent River on the eastern island, a complex of catacombs serves as experimentation grounds to a school of magi. Aspiring mages can journey here to seek enlightenment and pass the final trial by besting the local magi and their summoned creatures in combat, to receive their tokens. A deep abyss on the eastern slopes of Mount Stormreach is told to connect the Realm Plane with Hell. Although the portal itself has never been found, the demonic creatures inhabiting this place give credibility to the rumours. It is told that by defeating the Dark Reaver champions and gaining their tokens, one can become a demon, forever bound to the infernal plane.